I buy new holsters like a lot of people buy new shoes on a whim, because I want to, to reward myself for surviving a hard week, to match a new belt, or just because I’m bored with the old ones. I don’t need much of a reason to buy a holster. I have a large ammo box that serves no other purpose than as a repository for old holsters. So, these are my two busiest holsters for the snubby this week. Next week, it may be something different. Both of these offerings happen to be from Galco. Now, I like Galco leather, but this doesn’t imply any special endorsement of Galco products. My favorite gun shop happens to be a Galco stocking dealer so I can usually find the holster I want conveniently without chasing all over the country, and most importantly, I can buy them on impulse (cf. shoes above.). Galco makes solid duty-grade holsters, not terribly exciting, but functional, and a bit over-priced. This holster and I have a lot of miles together. It is a single-ply design with a suede-like unfinished finish. It does not have extra panels to try to make it look like a wallet in your pocket. It relies on its thinness to conceal itself in the pocket. For this holster to work properly, a little slack is required in the pocket. Dress slacks or cargo shorts are the ideal hosts for this holster. If you use it with very tight blue jeans, it may print. I make a habit of buying my jeans about one size too large so that they can accommodate my various holsters. I can wear a 36 waist, but I will buy a 38 so that my pockets are not too tight, and I can slip a pocket holster or an IWB into them if I want. In the hot summer months, this pocket holster in a pair of cargo shorts is ideal for easy concealment and hot weather comfort. In dress-up situations, this holster drops into the blousy front pocket of a pair of dress slacks and disappears. It works beautifully. Just make sure that your pockets are deep enough. I bought a nice pair of silk slacks from Men’s Warehouse that I really like, but the pockets are kind of shallow. When you sit down with the pocket holster in these pants, you will suddenly experience anxiety that the gun is about slide out of your pocket. Check the pocket depth when buy slacks. I like this holster a lot. Its your standard pancake belt holster. It holds the gun in the classic FBI cant the grip tilted forward so its easy to grab quickly at a natural angle. Belt holsters are really my favorite kind of holsters. They’re comfortable and hold the gun in an excellent position for a quick draw. 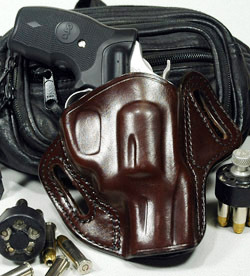 This holster is especially good at holding the grip next to your body. This is important for concealment. I have tried a number of pancake-style holsters that allow the grip to lean out away from your body. I call them floppy. The Concealable isn’t floppy. It holds the gun next to your body very positively. 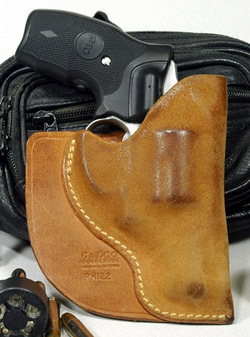 This holster is open on the bottom so it accommodates any J-frame regardless of barrel length. I bought it for the Model 60-15 with its 3 barrel, but it also carries the shorter barreled Model 637 just fine. A nice, firm 1.5 gun belt is a meaningful help to these kinds of holsters. Thinner belts let the holster move around more and get out of position. Most holsters, unless they are specially made, assume a 1.5 belt. A thick belt that is designed for carrying guns will improve the comfort of any holster. I get my belts from Haugen Gunleather. You’ll hear people say that if you’re going to use a belt holster, you should carry a bigger gun than a snubnose, because the belt holster will handle the weight of a full-sized service handgun. There is some validity to that. At the same time, if what you really want to carry is a lightweight snub, the belt holster makes for a very comfortable carry. Sometimes, I just don’t want the weight of a service auto and its spare magazines on my belt. With a lightweight snubby in the Concealable, you can almost forget that its there.